Picking a baby doctor is a big deal. You will soon realize after their arrival that your protective mama instincts are STRONG and you will only want the best care for your little one. Picking the professional to look over their health requires alot of attention. 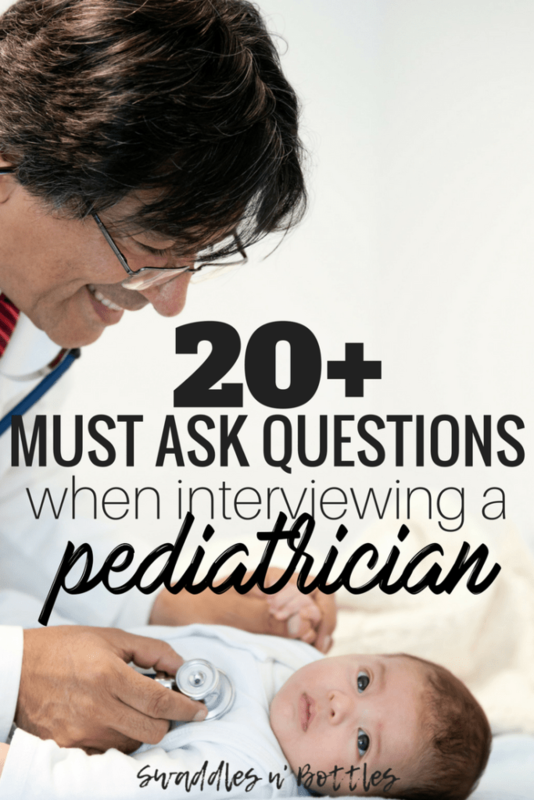 I have to admit as a first time mom, I felt kind of strange about “interviewing” a doctor. I almost felt like it might be insulting to them? I soon found out it is perfectly normal and they are very open to it. It’s important for both parties to be on the same page when it comes to the health of your child, so most doctors are very open to the interview process. Here’s how to get started with this whole selection process. First and foremost make sure that the office accepts your insurance. It may be easier to work backwards on this one. Instead of calling around to all baby docs in your area, simply contact your insurance company and ask for a list of in network doctors within the mile radius you are willing to travel. Once you have a list to work with, you can begin doing your research. The internet has made the research process easier, but don’t believe everything you read. I was SET on a doctor for Emmy based on reviews. He was 5 stars all around and seemed golden. He had even written a few articles that were published online that made me love the idea of him even more. But then I met him, and I quickly realized he wasn’t the one. It was a personal preference and nothing about his expertise. So big lesson here is don’t just base your decision on the internet. A face to face meeting is crucial. I would suggest having a list of 3 potential doctors to interview with an additional 3 back ups. Let’s hope it doesn’t get to the point of having to do 6 meetings, but it’s better to be prepared. In order to set up a time with your selected pediatricians, simply call their office and speak with someone who sets the appointments. let them know your expected delivery date and that you would like to schedule a time to see if Doctor X is the right fit for your family. Is there a separate room for infants? You will be taking your baby there when he or she is just a week old, you don’t want her rubbing elbows with a snotty nose kiddo. Do they have a separate waiting area for well children and sick children? You don’t want the routine check ups that come later on to lead to a sick visit just a few days later. Is the office staff friendly? Do they seem to operate in an efficient manner? One negative about our first doctor interview was the front desk staff seemed very confused and getting some simple paperwork at the end of our appointment was a 10 minute ordeal. This wouldn’t be fun with a sick baby. Is the office clean? Are there dirty toys lying around? Once you get in to meet with doctor, this is where things really get down to the niddy griddy. Here is a list of questions I took with me. Remember, before you ask your doctor these questions, you need to know what answers you are looking for and what is acceptable. Sit down with baby daddy the day before the first meeting to go through these questions. Are there other doctors at the same practice who could see your child if Doctor X is not available? This was a big issue for me. Our insurance policy did not cover urgent care very well and I did not want to have to go just because the doctor took Fridays off. Having another doctor at the same practice is a BIG plus! What are the procedures for calling and speaking to a nurse regarding an issue that may not warrant a visit? What is the usual call back time? Where are labs completed? You will have to do a few once baby is born. It’s no fun to have to travel far with a itty bitty baby so being done in office or relatively close is a big plus. Do they take sick children appointments ahead of well children? This is a plus if your baby is sick! They get in quick but it can mean extra wait time if you are taking kiddo for a well check. Here is a list of “views” you need to ask about. These are the big ones you need to discuss before seeing the doctor! Immunizations: All at once? Spread them out? Sleep training: cry it out or no tears solution? Co-sleeping? Breast feeding or bottle feeding? Introducing solids. Waiting until 6 months, 1 year? Or introduce earlier around 4 months? I know this can all seem very overwhelming, but you are already on the right track by researching how to be prepared. Grab a pen and paper and your baby daddy and get to talkin’! The time and effort you invest in making this decision will be well worth it when you realize how comforting it is having full trust in the man or woman taking care of your baby’s health. New mamas-Are there any other important questions you would add to this list? Comment and share!